I blundered into some old Punch and Judy memorabilia (circa 1700's-1800's) and thought how odd it must have to sit and watch wacky characters pummel each other while they acted out farcical situations. Boy, why does THAT sound familiar? Amazing how we've 'evolved' as a civilizaton. ... he said facetiously (maybe). Now--where did my friend "Sockie" go? 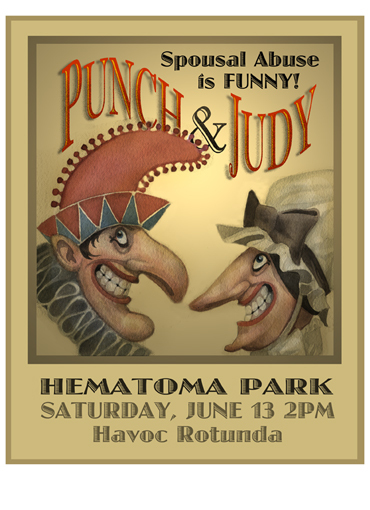 Punch and Judy would be perfectly acceptable today - as long as Judy is doing all of the punching. This page contains a single entry from the blog posted on June 16, 2012 1:10 AM. The previous post in this blog was Sketch Book Page.